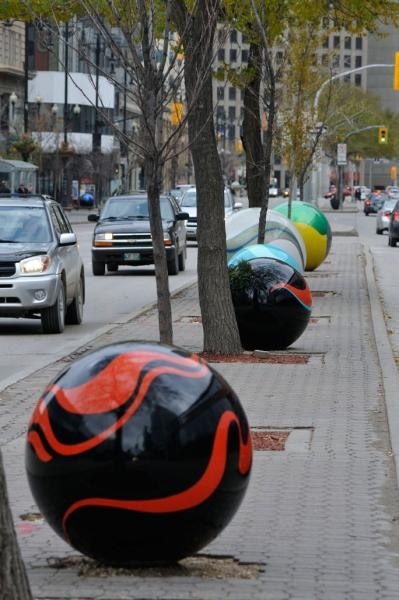 What started out as Marbles on Portage has become Marbles at Mayfair. 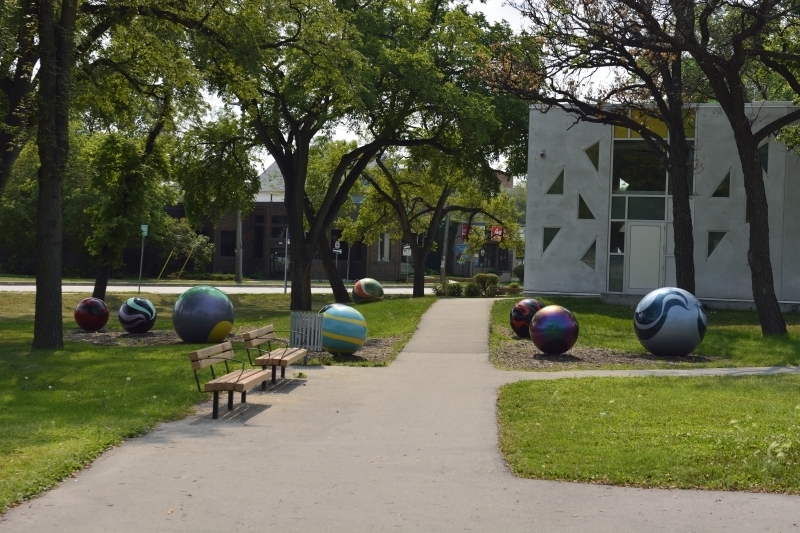 These whimsical sculptures were moved from the median on Portage Avenue to the yard around Mayfair Recreation Centre in 2016. 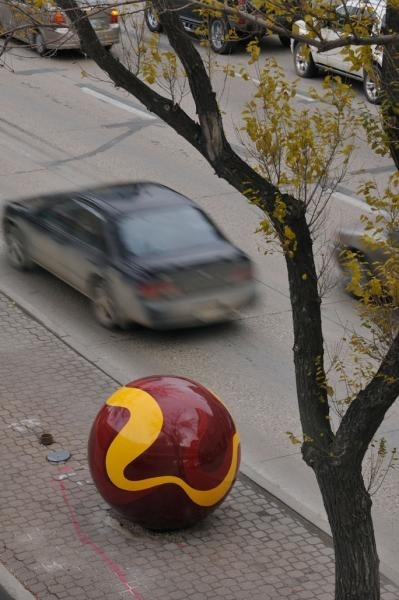 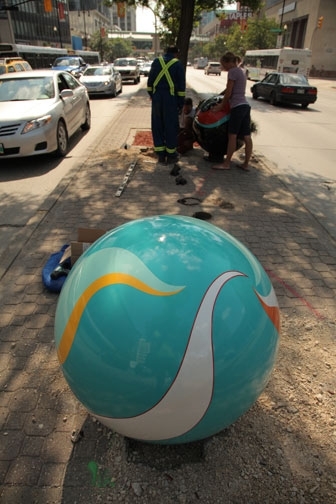 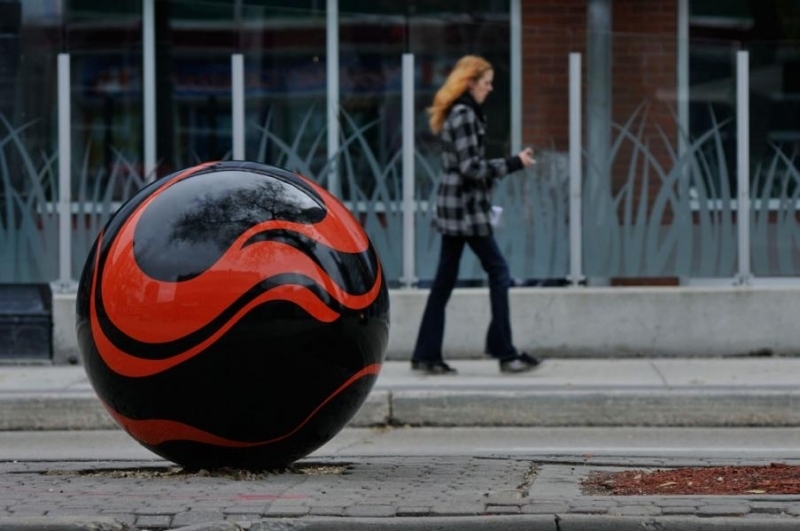 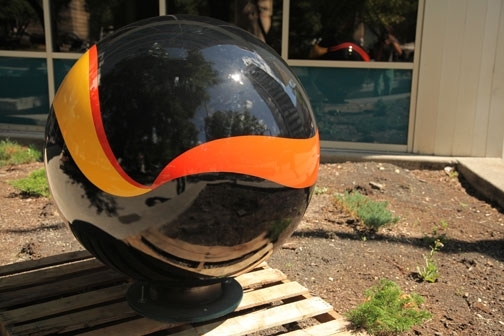 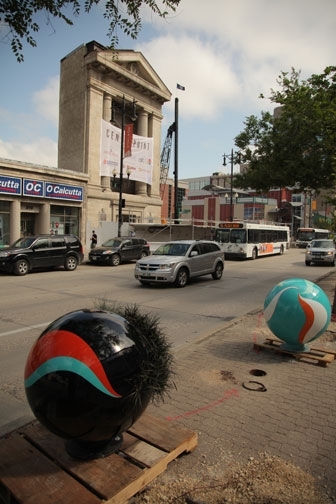 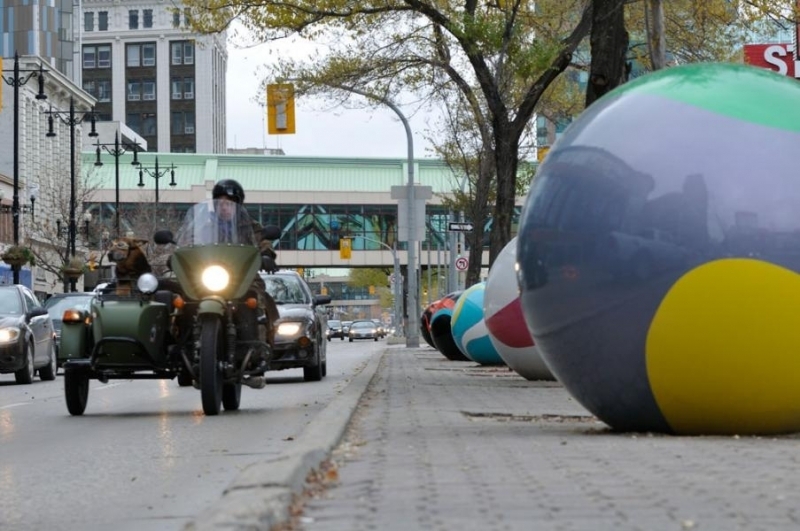 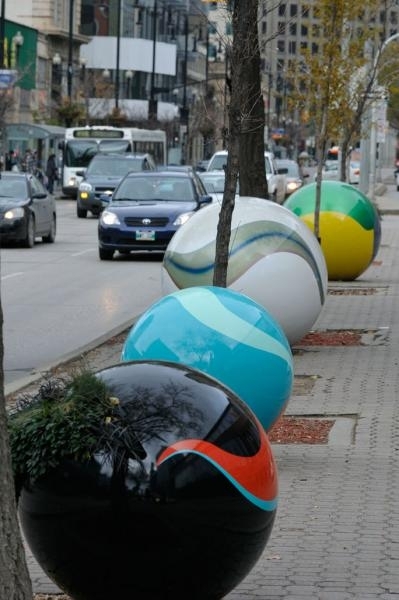 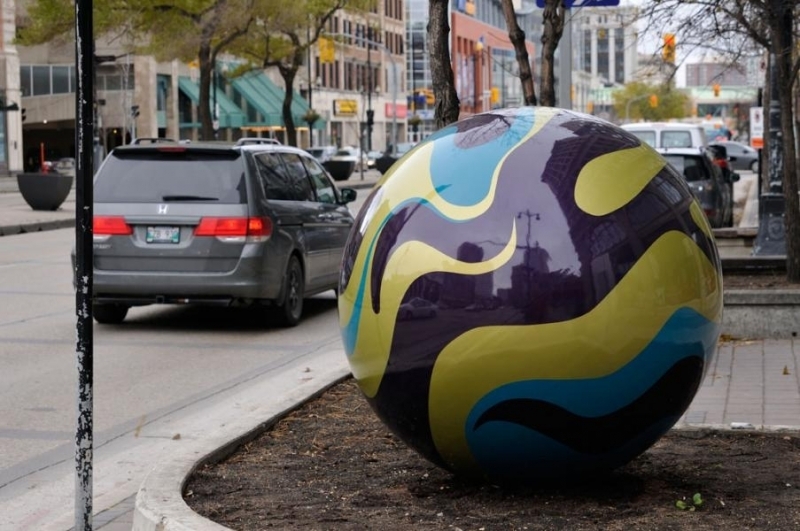 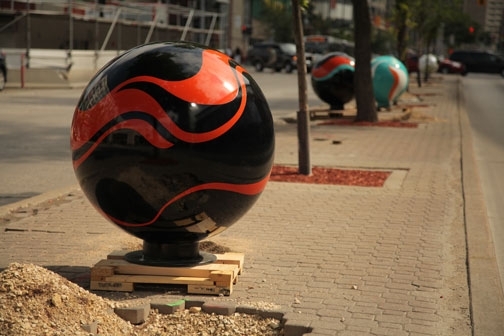 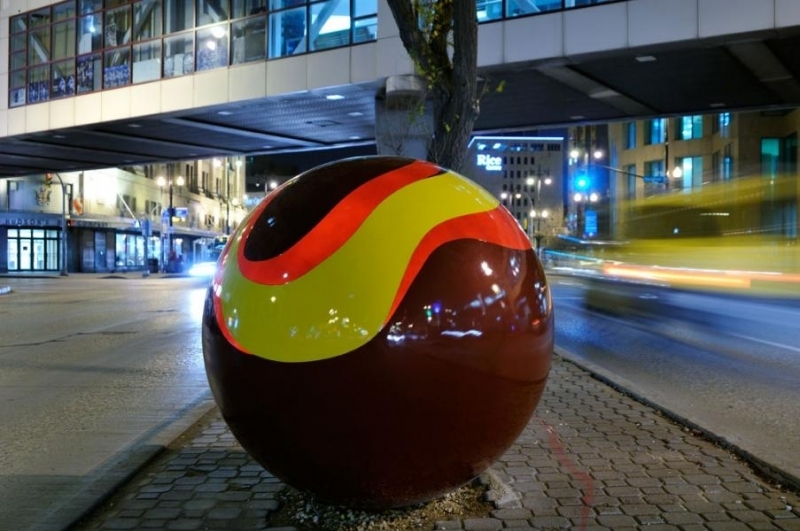 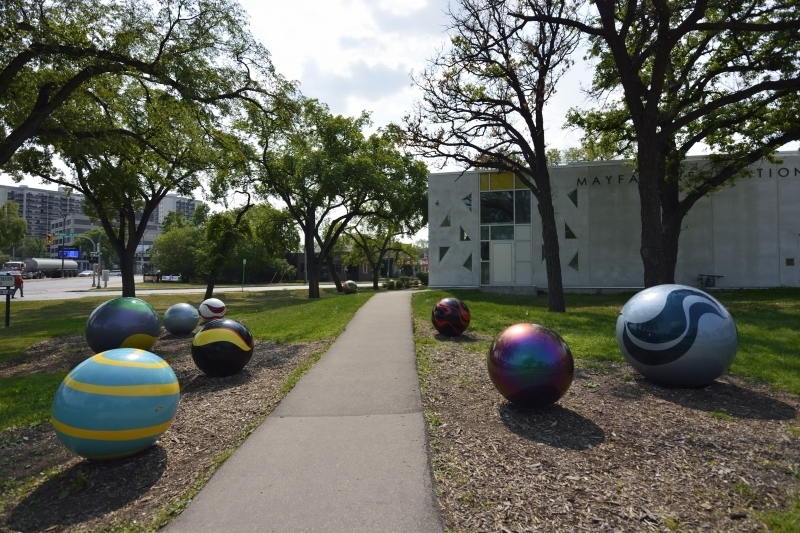 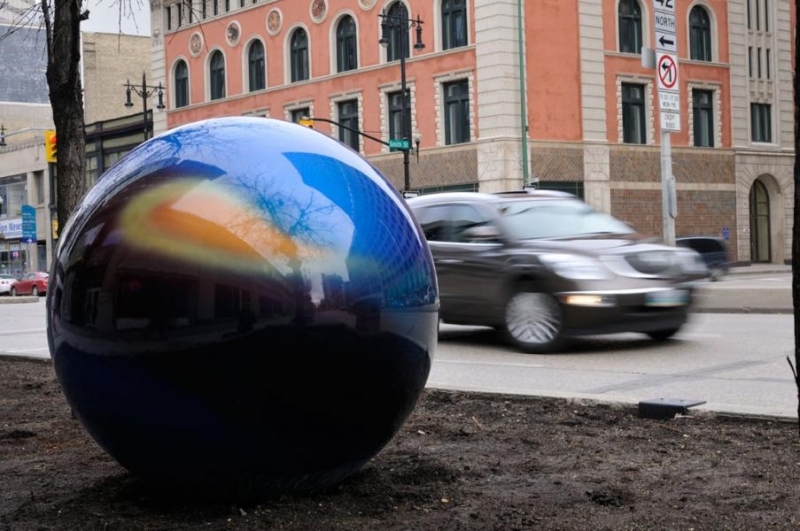 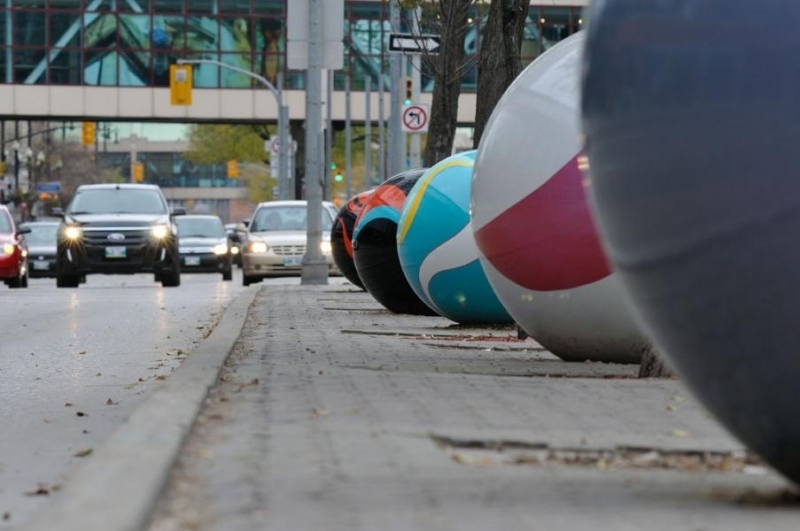 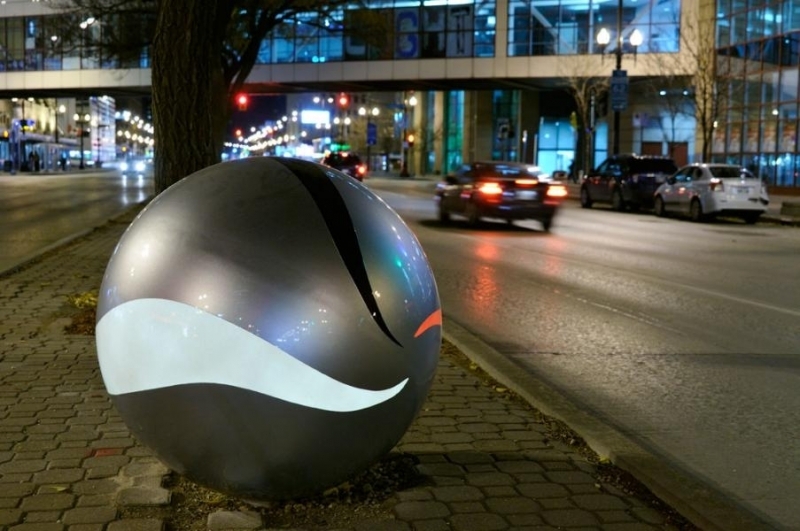 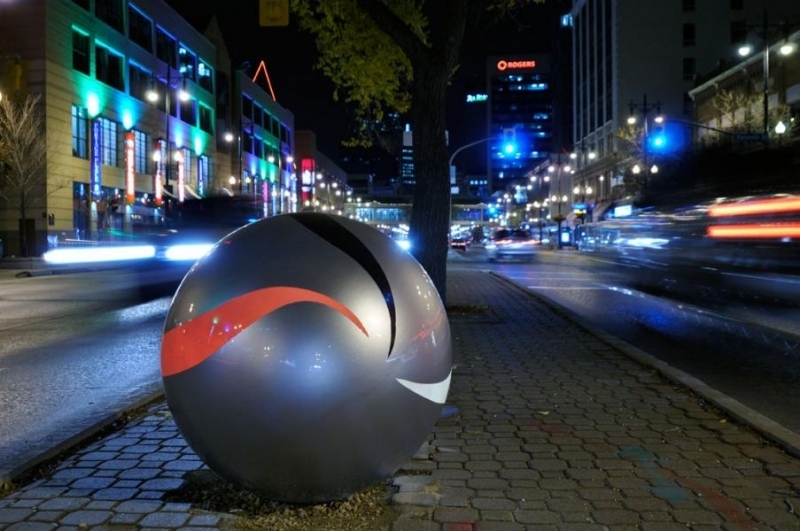 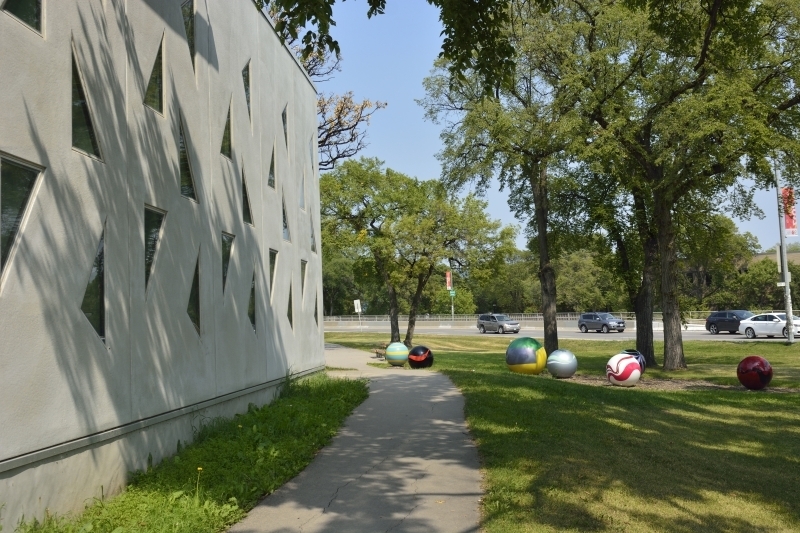 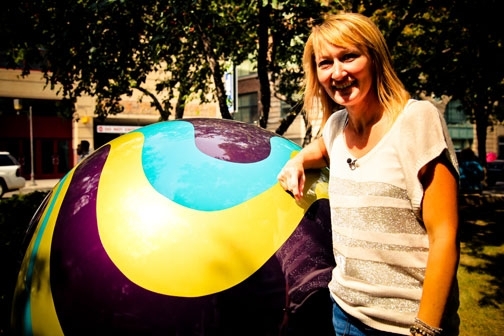 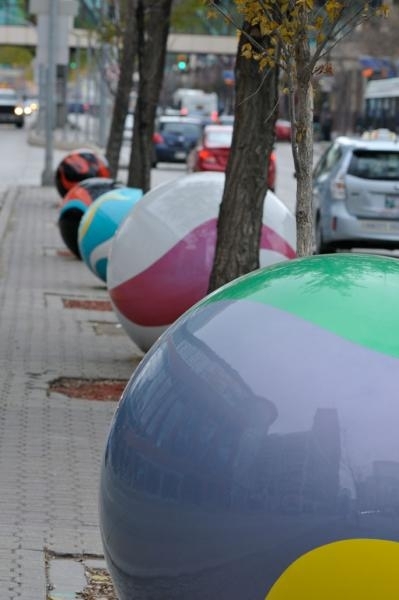 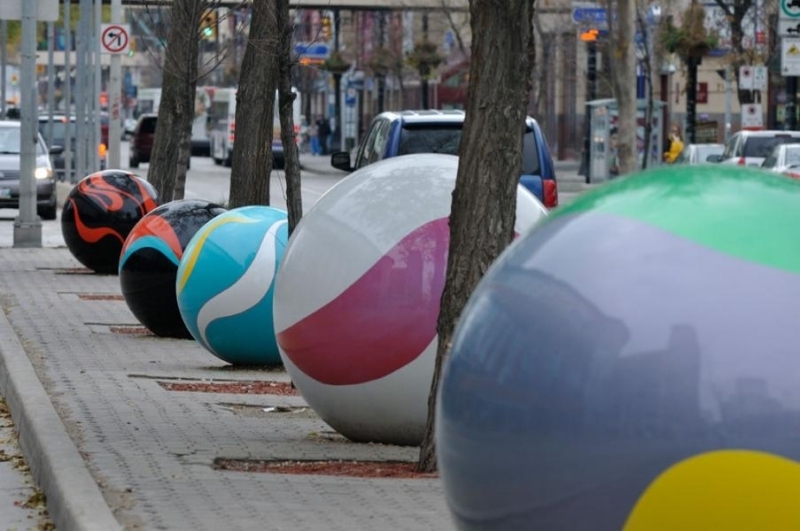 With Marbles on Portage, artist Erica Swendrowski has created a unique and playful project on one of Winnipeg's busiest thoroughfares. 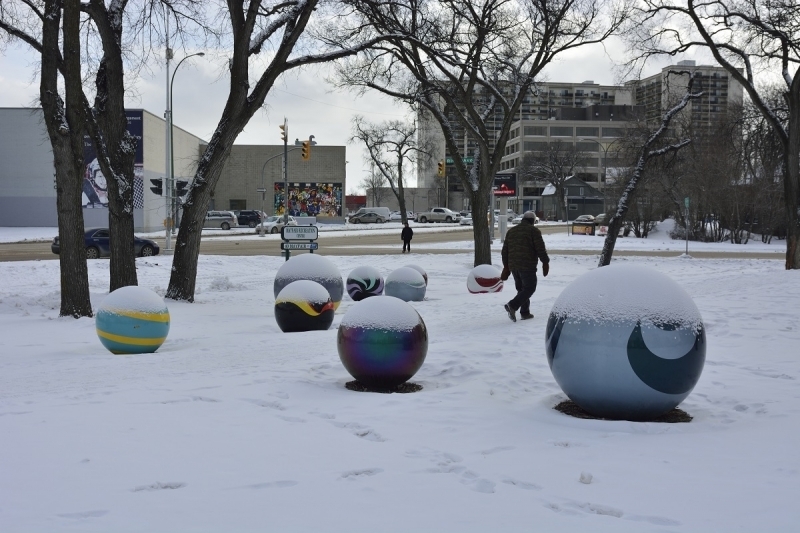 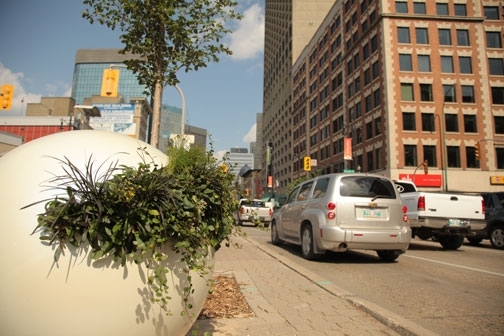 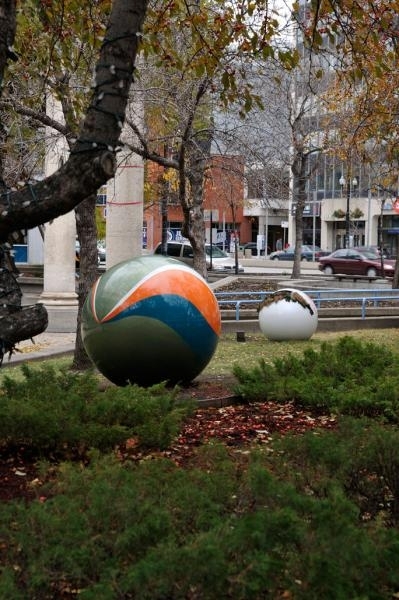 The 21 larger-than-life marble sculptures in planters and on the median along Portage Avenue, captivate the imagination of young and old alike. 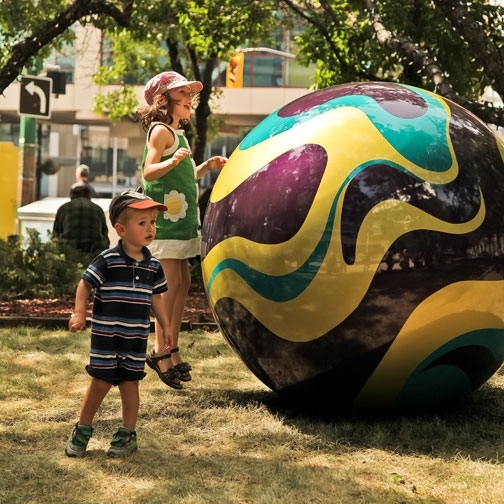 By enlarging these common and tiny playthings to giant proportions, the artist has created a whimsical, almost magical piece. 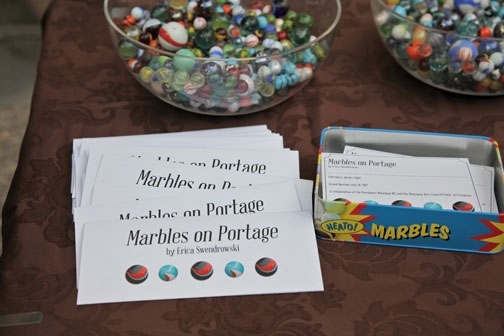 Marbles on Portage encourages the onlooker to think about familiar, everyday items in a different way, and perhaps discover how such items contain beauty and intrigue they hadn't noticed before. 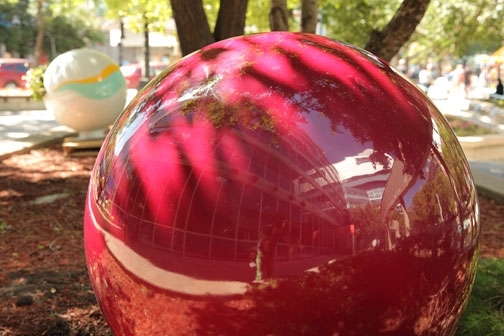 While staying true to the distinguishing characteristics of traditional glass marbles, the sculptures also incorporate soft glowing light and living plants. 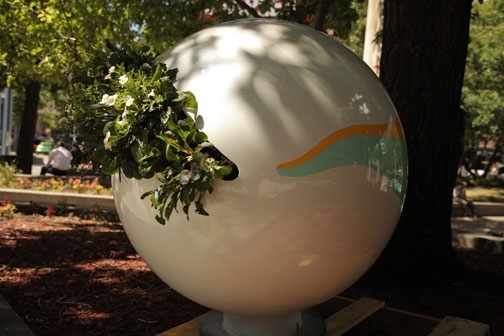 The diverse elements will create an atmosphere of imaginative possibilities day and night all year-round. 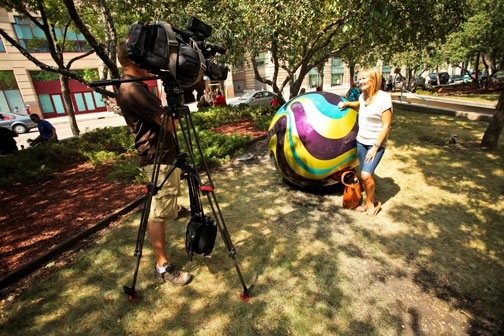 In 2010 Erica Swendrowski was selected in as the Artist-in-Residence in Community Gardens. 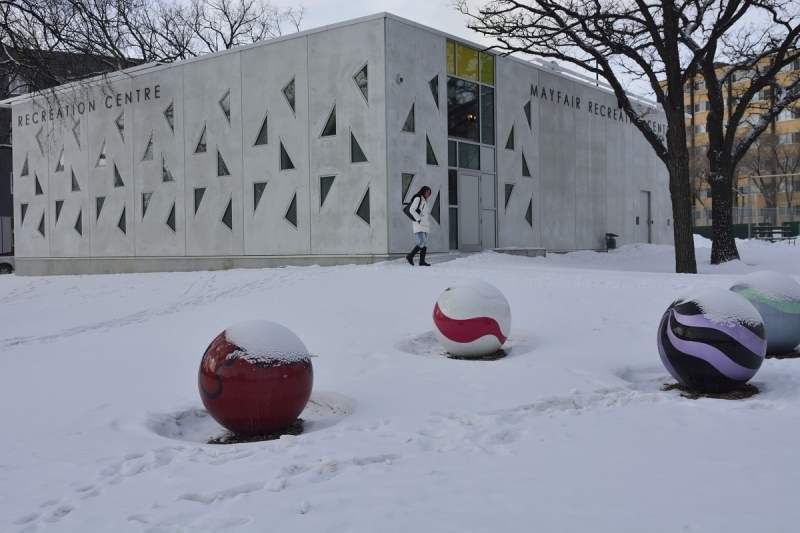 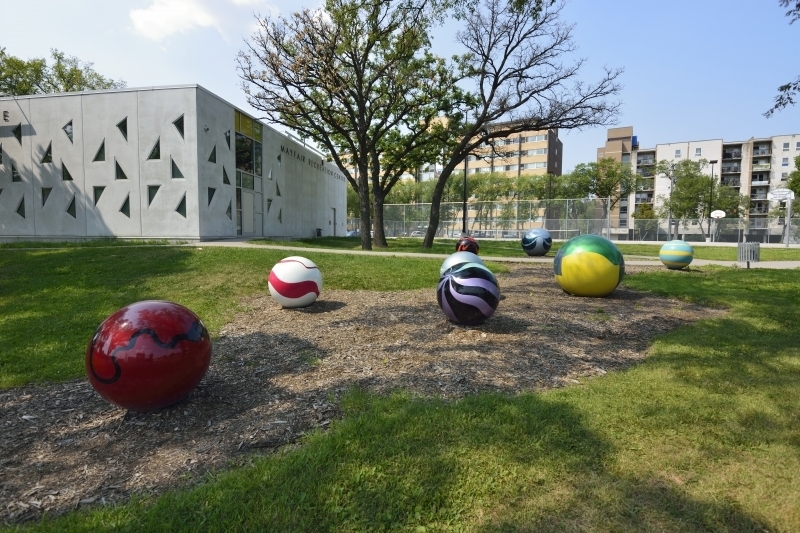 This unique residency came about as a result of conversations between the Winnipeg Arts Council and the City’s Public Works Department based on a desire to integrate artists into these spaces that focus on both community and food production. 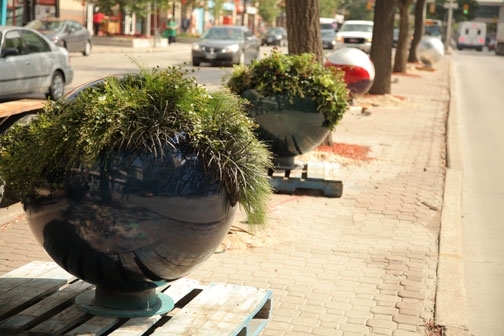 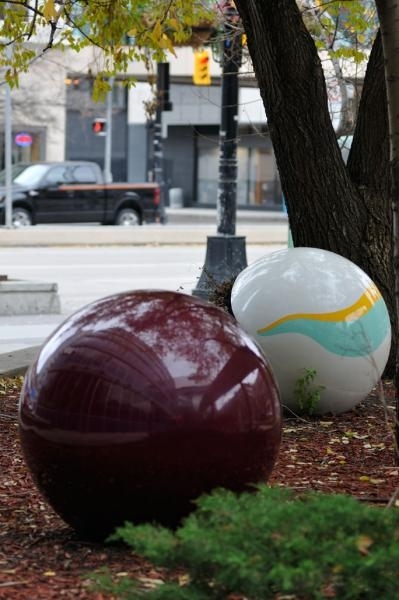 In addition to creating a series of sculptures and sod furniture in community gardens entitled living living room the project also included this collaboration with the Downtown BIZ to have an artist create plant-based sculptural works on Portage Avenue. 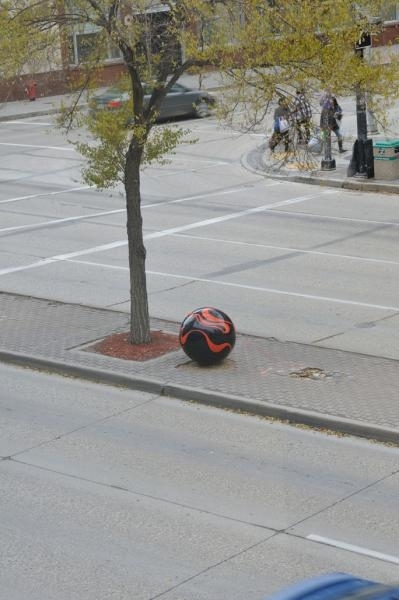 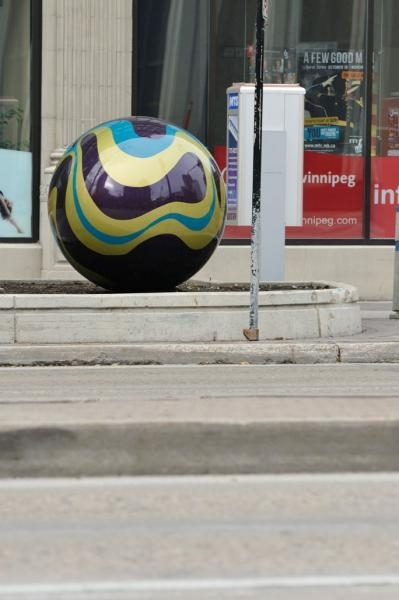 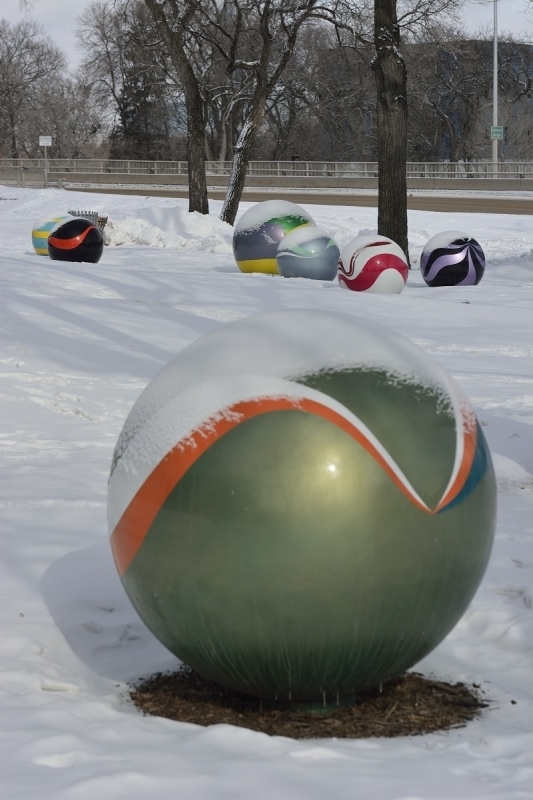 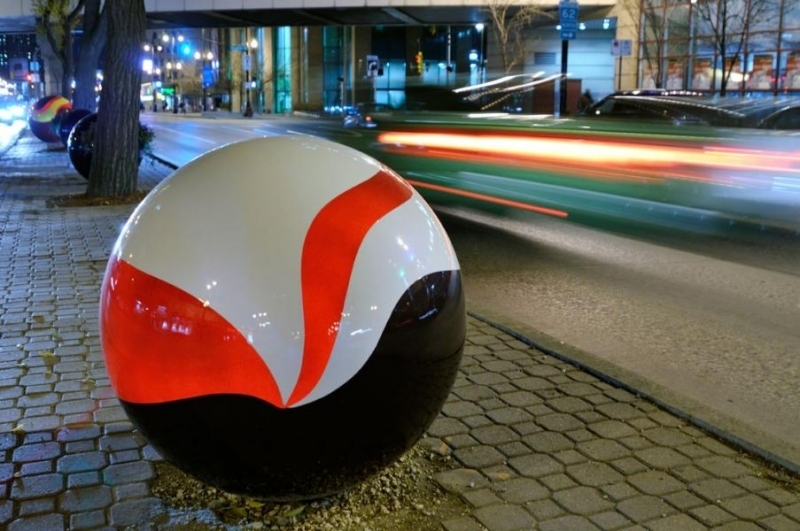 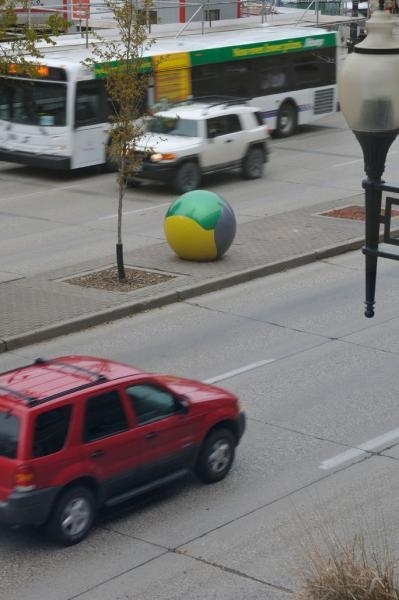 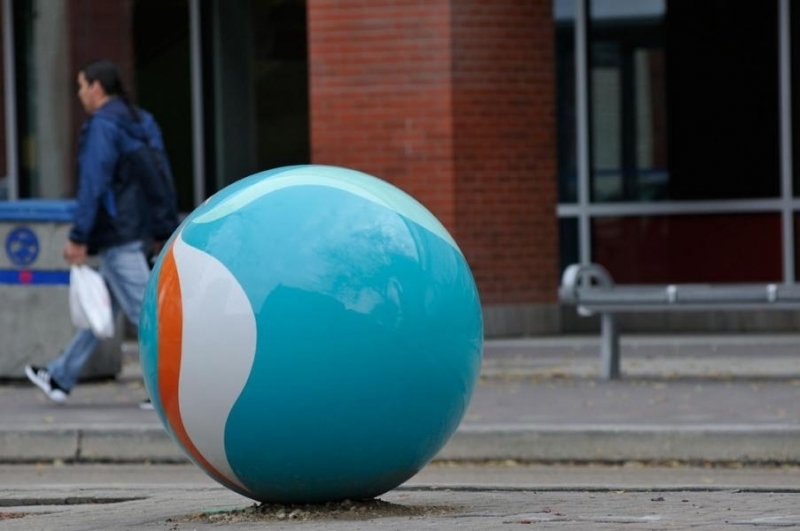 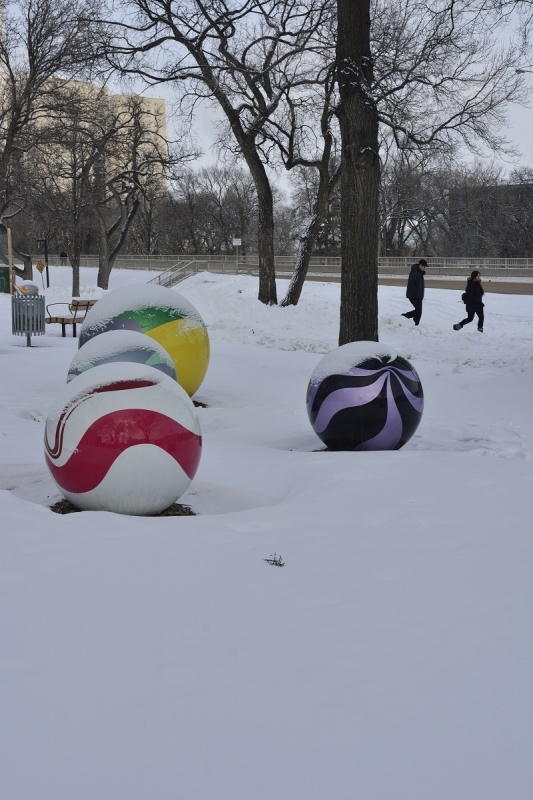 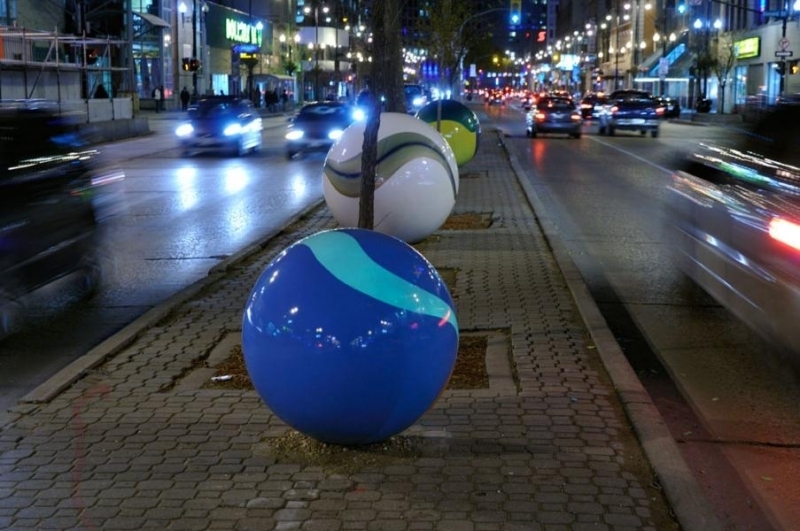 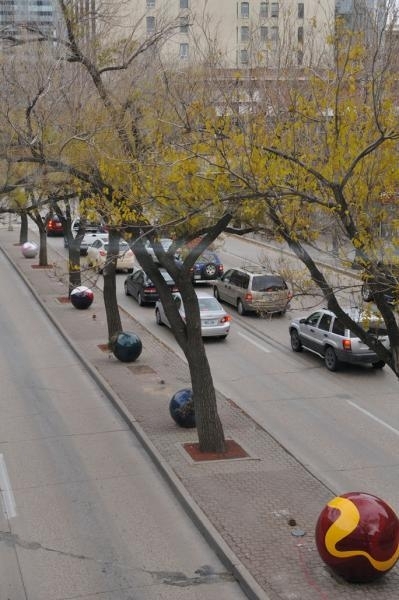 There are sixteen 3’ marbles and five 4’6” diameter marbles along Portage. 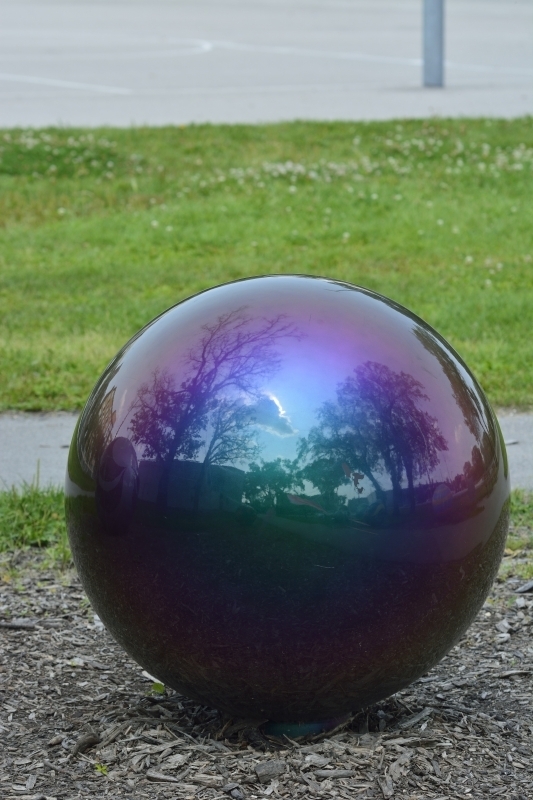 The marbles are made out of six different colours of gel coat resin that is sprayed into two separate mould halves. 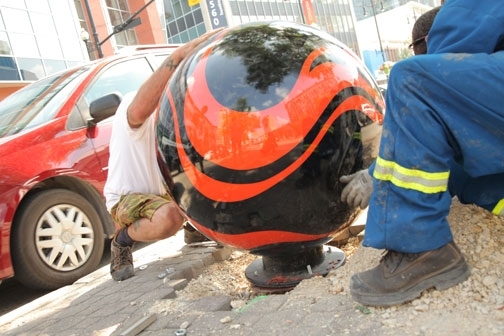 The two pieces are then glued together forming the sphere. 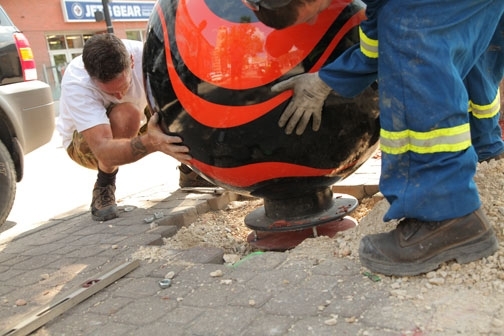 The ball is then sanded to get rid of any imperfections and the seam finished/smoothed over with bondo. 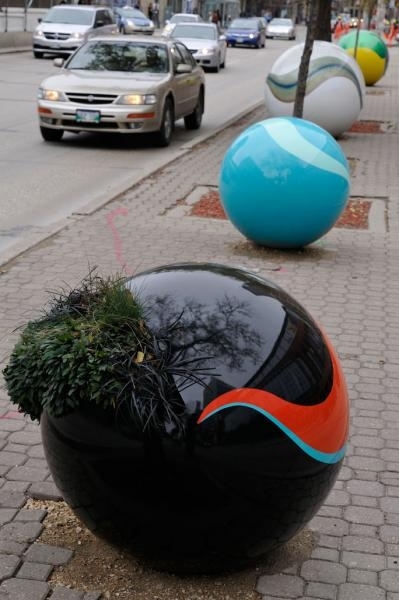 The designs were then taped out and painted onto the marbles with automotive paint. 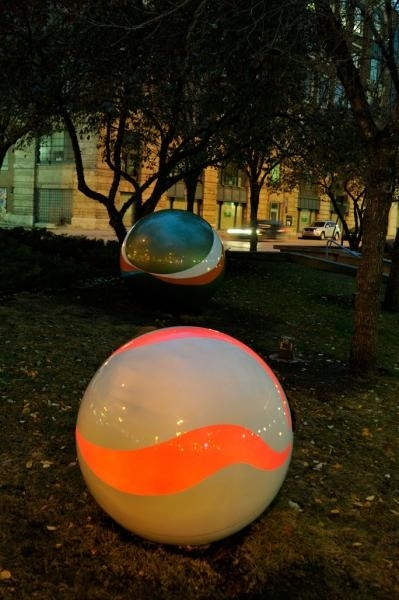 The glowing lights are achieved from the natural gel coat colour that is covered with two to three layers of top coat. 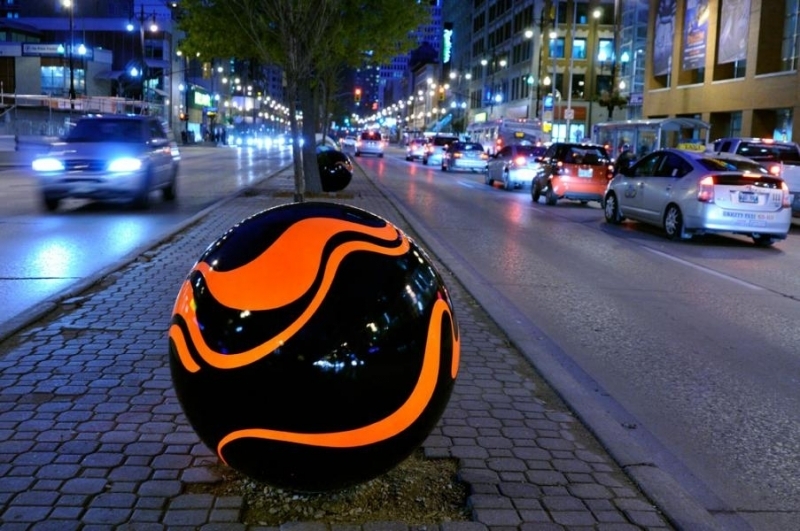 A 100 Watt bulb is placed inside the marble to create the glowing effect. 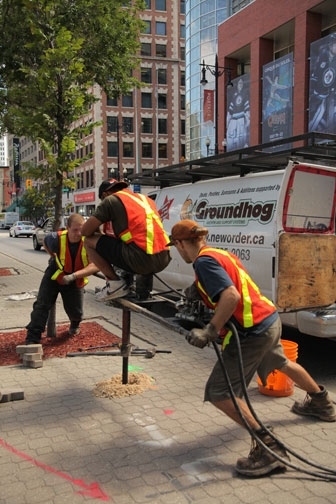 They were installed by groundhog anchors. 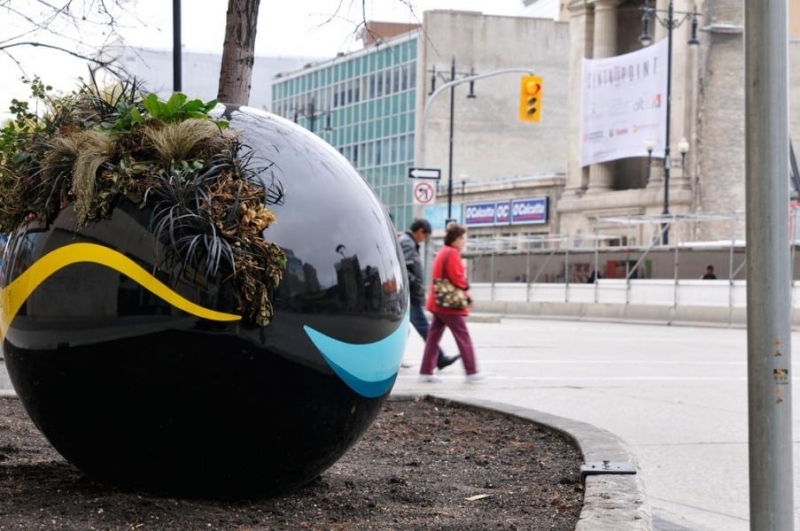 The plants are planted in a felt ‘pocket’ inside the marble. 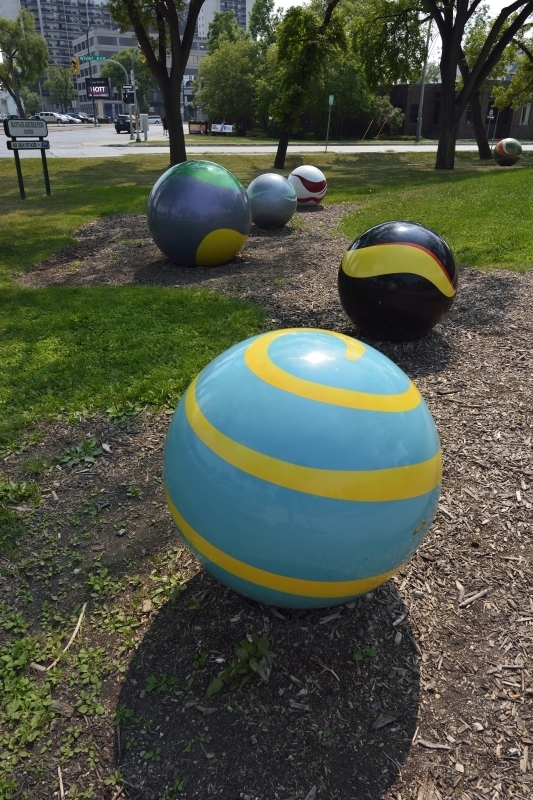 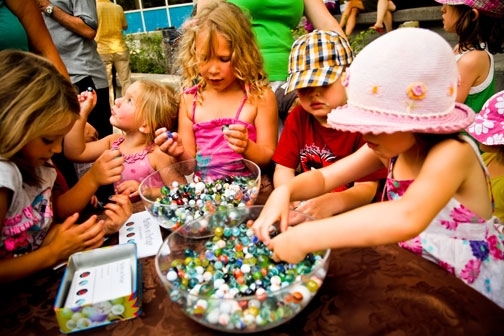 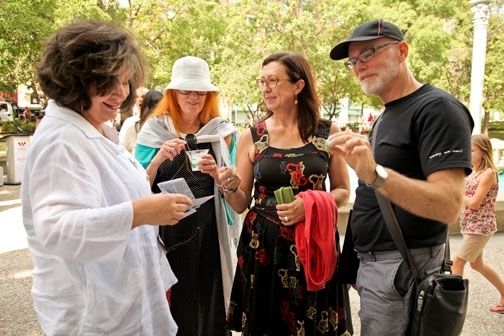 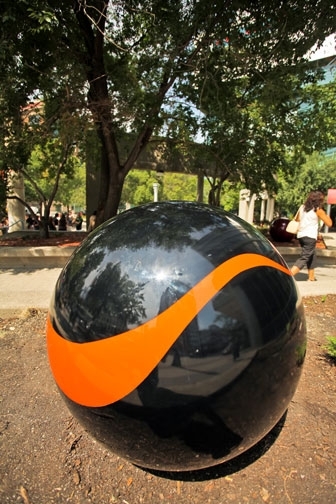 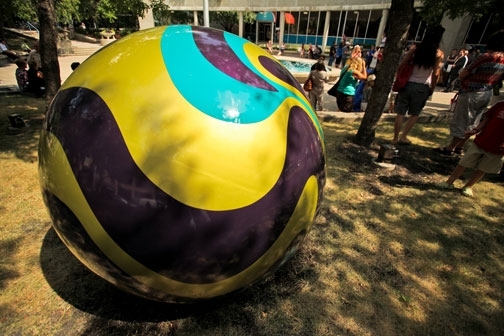 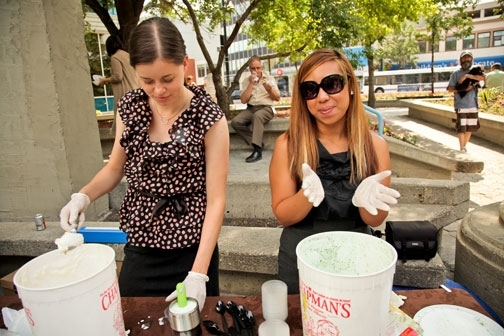 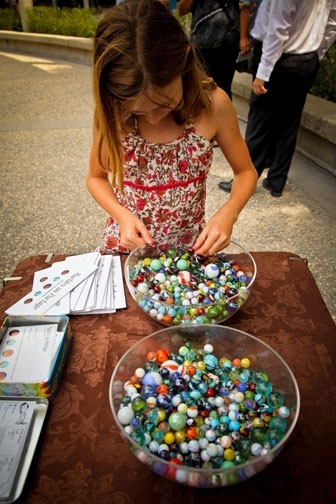 The Marbles on Portage project was officially opened at noon on July 31, 2012 with ice cream and marble give-aways in Air Canada Park. 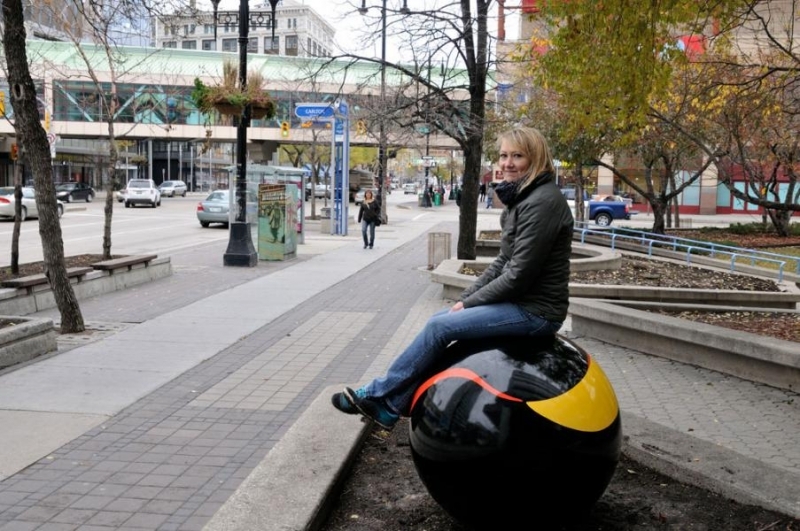 Winnipeg artist and landscape designer, Erica Swendrowski, combines her formal training in Landscape Architecture from the University of Manitoba and her passion for place-making with sculpture to create amusing, out-of-the-ordinary experiences within the public realm. 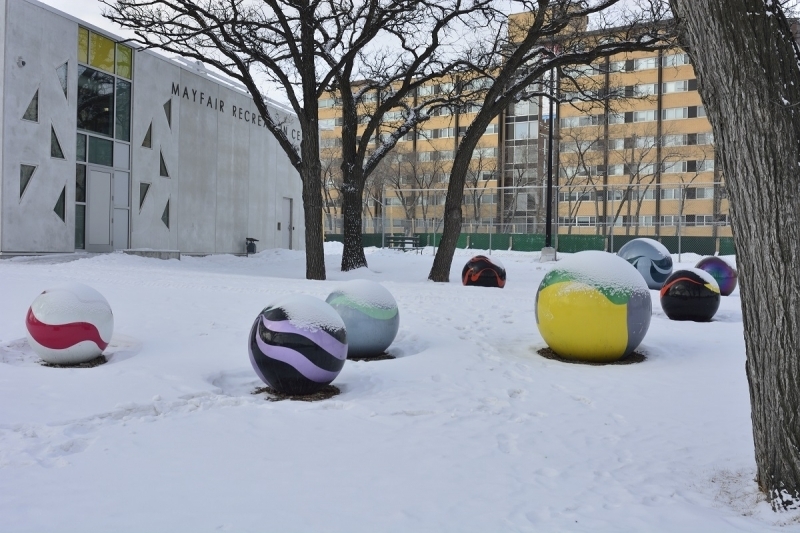 Interested in altering human activity and the perception of place, Swendrowski responds to existing spaces with familiar, slightly altered objects from everyday life. 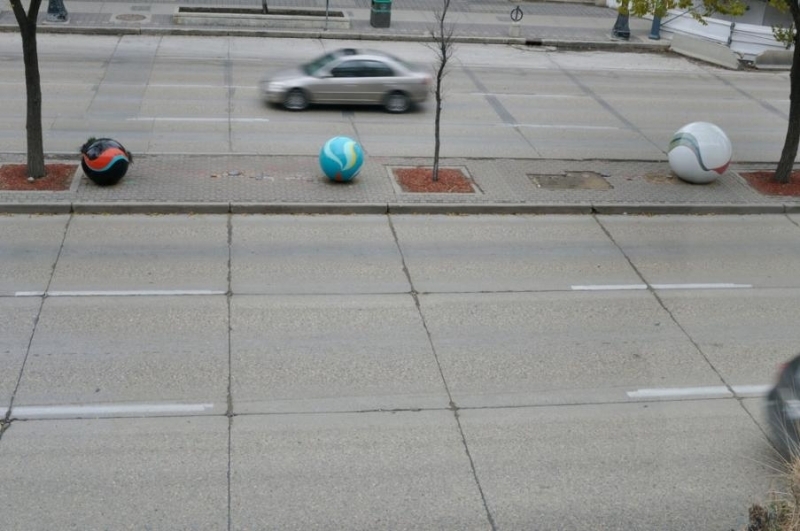 The objects, placed in surprising and seemingly out-of-context spaces, reintroduce a familiarity of place through memory and personal associations. 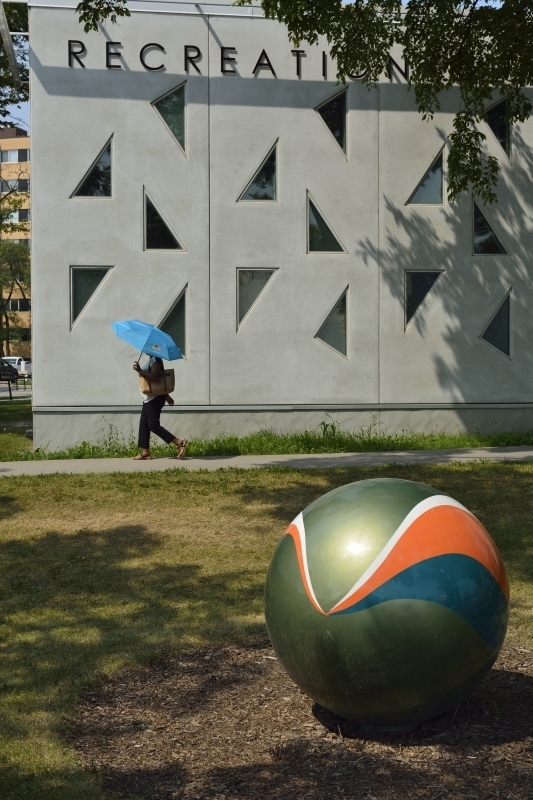 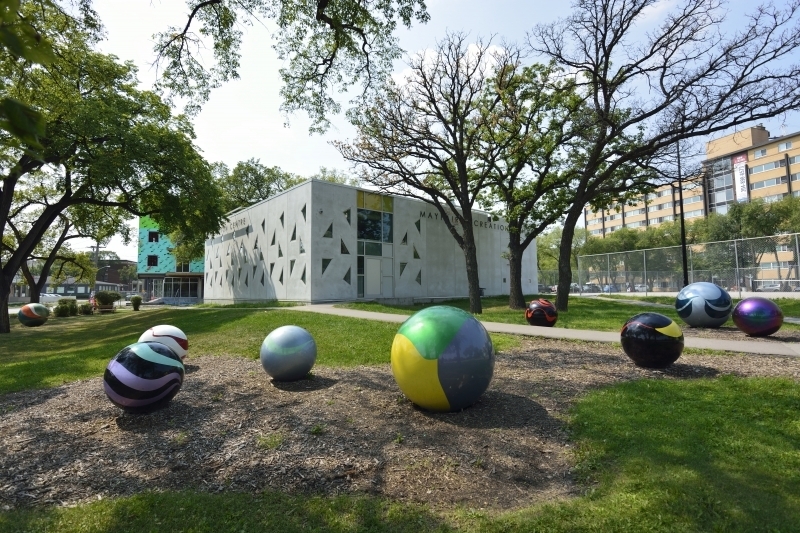 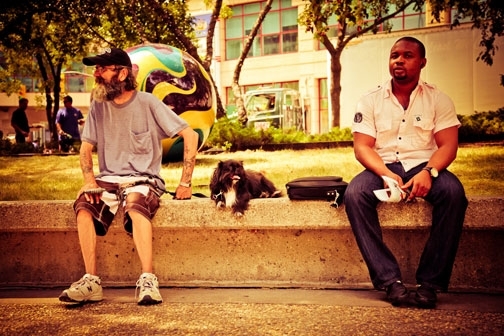 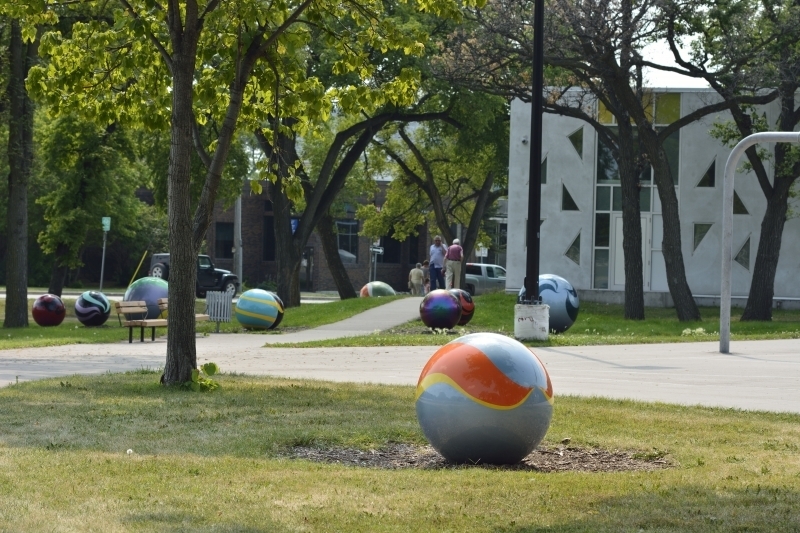 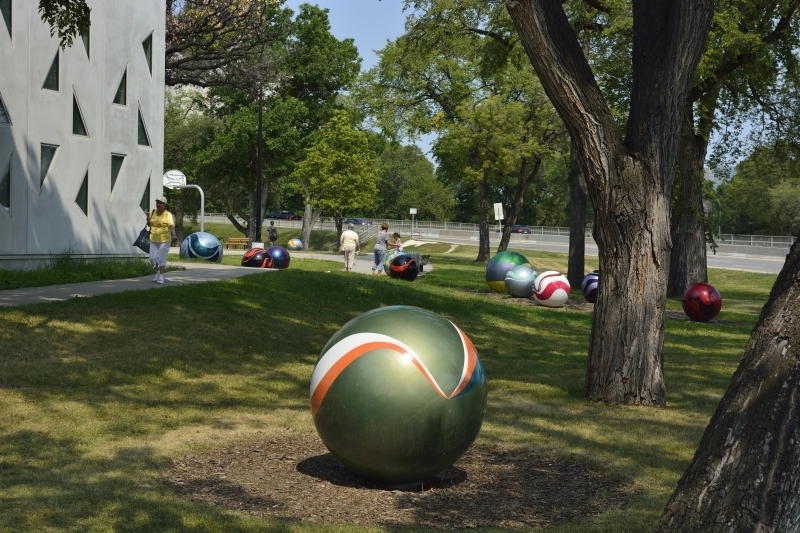 Marbles on Portage, is Erica’s fourth public art installation in Winnipeg following Jelly Bean Park (2006), Hearts on Portage (2007), and living living room (2011).